These were clothes washer kids in Ethiopia. I've been thinking of them recently because I hired a maid. One of the guards at my place knew her. She lives in the slum next to my apartment. She comes a couple days a week and does laundry, mops the floor and does dishes. For me, the most important bit is the laundry. For the last year I've been washing my clothes by hand in the sink and that gets old. I have enough money now that I could buy a washing machine, but I'm thinking about moving to another part of town soon and it's cheaper to hire someone. In Africa, everyone with a job has a maid or a relative who doesn't pay rent who functions as a maid. I tried pretty hard to avoid hiring someone. I went to a dozen laundry mats and asked how much they charged but they all said it would be $1 per item for laundry and $3 for dry cleaning. I explained very carefully that I don't need dry cleaning, just laundry with soap and water. In the end, I found one place that offered to do it for $3.50 per load but when I went back there was a new employee working who said the shop was for dry cleaning only and it was $3 per item. Another thing I tried was to hire a computer science student as a way to support him through college. It would have worked out well for him because I could schedule around his classes. I was prepared to pay him about three times the normal wages because he was a student. He said he would mop the floor but there was no way he would do laundry. He has another job now which pays less per hour and doesn't work around his schedule. And I have a maid. 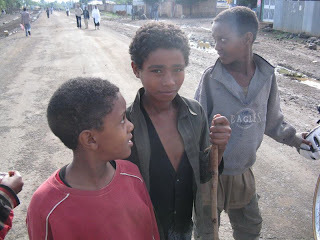 Anyway, it all reminded me of these Ethiopian kids. The story is that Henok and I arrived in town and these kids took us to a hotel. They showed us around the room and told us all the selling points. Me: Where are the toilets? Kids: You can just pee in the sink. Me: Uh, the sink just drains on the floor. Kids: Yeah, but the floor is sloped and so it drains into the shower and down the drain. Me: Ok... What about if I want to take a dump. Kids: It might be able to fit down the shower drain? It turns out that the toilets were in the backyard, but I worry that other guests never discovered that. Certainly the place smelled very nasty. I didn't take a shower that night. After they showed us around, Henok gave them all his clothes to be laundered. I guess, we assumed that they were associated with the hotel, but actually they were just street kids. The hotel employees knew them, but they didn't like them and refused to let them have any water for washing clothes. Less enterprising kids would have been discouraged, but these kids managed to find water. It was stinky water from the swamp. When the clothes came back they were dirtier and smellier than they had been originally. I forget how much we paid them. I think it was a lot. If I could go back, I would double it.